Approximately 1km past the Hamilton River track end a creek from The Camel tarns emerges. Proceed another 250m, cross the river and enter the bush just west of another smaller creek. Continue on the true left of the creek, cross the main creek at 1280m, and aim north-west to point 1790m. 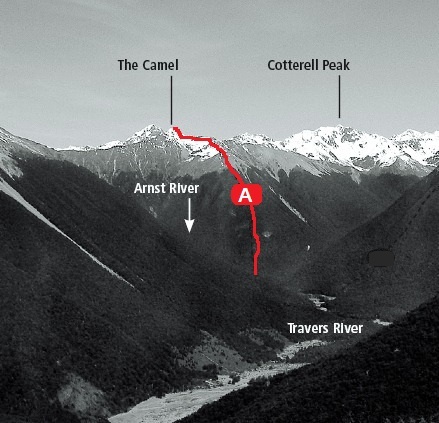 Follow the St Arnaud Range to the summit. A short distance up the Arnst River climb a spur to the range, taking care to avoid bluffs in the bush. A rock scramble leads to the summit. Descend north-west from Pk 1785m down a spur on the true left of a creek.